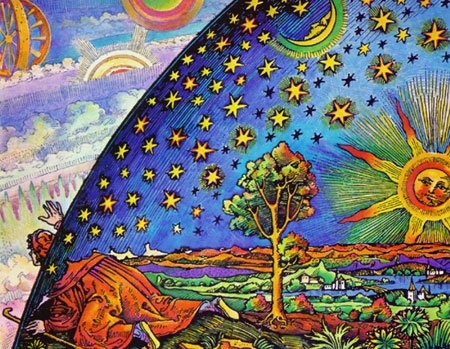 The Flammarion Engraving depicts a medieval missionary crawling under the edge of the sky to explore the Empyrean, or Transcendent, beyond. Transcendent Consciousness is beyond the realm of duality, it cannot be touched, manipulated or used (like electricity, or any kind of energy). It informs everything – it is the source that makes flowers beautiful, it gives the spark to all life. It is beyond the manifest yet is everywhere and nowhere. We perceive the universe, but transcendent energy consciousness is beyond the infinite; it is both immanent (in everything) and transcendent (beyond everything). Edward Edinger, in his book, The Creation of Consciousness: Jung’s Myth for Modern Man, notes that Dr. Jung felt that “the experience of consciousness is made up of two factors, “knowing” and “withness,” ie, knowing in the presence of an “other,” in a setting of twoness” – essentially, the experiencing of opposites. While true, this is only a small part of the story. We can explain the operation and features of the universe using the most advanced scientific understanding and the most magnificent technologies – from Higgs Bosons to Black Holes to Dark Matter and Energy. Yet, the utility of science ends at the boundaries of the known universe – space and time. What lies beyond and behind everything transcends reason and the intellect, it renders powerless our most spectacular inventions and constructs; transcendent consciousness informs and gives rise to everything manifest but it, itself, cannot be perceived, much less imagined.